Recent advances in technology have allowed for a visualization of the major blood vessels supplying the brain, notably the arterial circle of Willis. This investigation does not require an invasive procedure (described with the next illustration), although an injection intravenously of a contrast substance called gadolinium maybe used (discussed with Figure 28B). Although the quality of such images cannot match the detail seen after an angiogram of select blood vessels (shown in the next illustration), the nonin-vasive nature of this procedure, and the fact that the patient is not exposed to any risk, clearly establishes this investigation as desirable to provide some information about the state of the cerebral vasculature. This arteriogram shows the circle of Willis as seen as if looking at the brain from below (as in the previous illustration). The internal carotid artery goes through the cavernous (venous) sinus of the skull, forming a loop that is called the carotid siphon. It then divides into the anterior cerebral artery, which goes anteriorly, and the middle cerebral artery, which goes laterally. The basilar artery is seen at its termination, as it divides into the posterior cerebral arteries. The anterior communicating artery is present, and there are two posterior communicating arteries completing the circle, joining the internal carotid with the posterior cerebral on each side. This is the same angiogram, displayed at a different orientation, as though you are looking at the patient "face-on,' but, wtih his/her head tilted forward slightly. 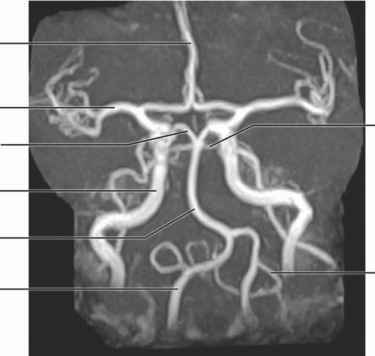 The two vertebral arteries can be seen, joining to form the basilar artery; it is not uncommon to see the asymmetry in these vessels. The posterior inferior cerebellar artery (PICA) can be seen, a branch of the vertebral (it is also labeled in the upper radiograph), but not the anterior inferior cerebellar artery, a branch of the basilar (see Figure 58). The basilar artery gives off the superior cerebellar arteries and then ends by dividing into the posterior cerebral arteries. The internal carotid artery can be followed through its curvature in the petrous temporal bone of the skull, before dividing into the anterior and middle cerebral arteries. 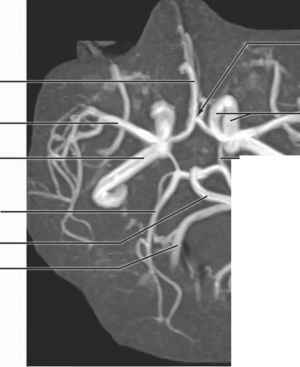 One of the characteristic vascular lesions in the arteries that make up the arterial circle of Willis is a type of aneurysm, called a Berry aneurysm. This is caused by a weakness of part of the wall of the artery, causing a local ballooning of the artery. Often these aneurysms rupture spontaneously, particularly if there is accompanying hypertension. This sudden rupture occurs into the sub-arachnoid space and may also involve nervous tissue of the base of the brain. 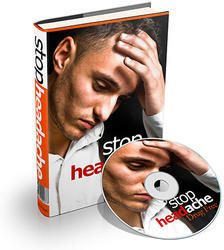 The whole event is known as a subarachnoid hemorrhage, and this diagnosis must be considered when one is faced clinically with an acute major cerebrovascular event, without trauma, accompanied by intensely severe headache and often a loss of consciousness. Sometimes these aneurysms leak a little blood, which causes an irritation of the meninges and accompanying symptoms of headache. An MRA can, at the minimum, visualize whether there is an aneurysm on one of the vessels of the circle, and whether the major blood vessels are patent. Note to the Learner: One of the best ways of learning the arterial supply to the brain and the circle of Willis is to actually make a sketch drawing, accompanied by a list of the areas supplied and the major losses that would follow a sudden occlusion. The blood supply to the brain-stem and the most common vascular lesions affecting this area will be discussed with the illustrations to follow. Internal carotid artery (ICA) ""